Think about publishing your own book! Poetry Nation’s parent company, Eber & Wein Publishing, is a full-service publisher dedicated to assisting authors who wish to independently publish their work. Our enthusiastic team of editors and graphic designers work collectively with writers to transform their manuscripts into professionally produced books of various genres. Taking a personal approach to publishing, Eber & Wein Publishing offers a variety of services geared toward the specific needs of each individual writer, delivering skillful guidance and education throughout the entire publishing process. Whether an experienced writer looking to sell your final product or an amateur poet hoping to create a simple keepsake to share with family and friends, Eber & Wein Publishing has the expertise to bring your vision to fulfillment, all the while allowing you to maintain complete creative control over your work. Print-on-Demand technology allows authors to order as few or as many copies of their book as they wish, as often as needed. In addition to collaborating with authors who want to produce entire collections all their own, Eber & Wein Publishing offers writers opportunities to publish individual poems as part of an anthology. 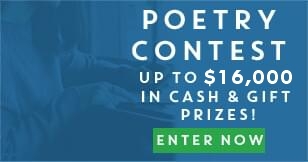 Every Poetry Nation contest semi-finalist is given the chance to showcase his or her poem in an Eber & Wein compilation alongside fellow semi-finalist entries. Although copies of each volume are available for purchase, there is no purchase required; inclusion in an anthology is free, completely optional, and has no bearing on final contest results. By signing off on publication, poets give Eber & Wein Publishing permission to print their entries one time, but authors maintain all copyrights. Why should I have to pay for that? Shouldn’t I be the one getting paid for my work? As you can see, a tremendous amount of work is poured into each anthology. To maintain the integrity of the publication and its contributors, it is critical for us to be thorough throughout every phase—because at the end of the day (or final printing) there is no undoing what is done. This is truly a great deal of work when you consider this fact—while the offer to purchase the book is sent to all semi-finalists, not everyone buys the book (again, purchase is not required). Many do, but more do not. A good number of writers are happy just knowing their poem is circulating around the world and has a vast audience. The money that is made from book sales covers the cost of running the contest, the prize money, and the labor of our editorial staff. At the end of the day, it’s a break-even.